RATED R. You must be 21 years or older for this show! Already wondering how to entertain your visiting relatives this holiday season? Methow Arts has you covered! We’re bringing the renowned Second City Comedy to town with their hit revue, The Second City’s Holidazed and Confused. This hilarious show pulls a festive mix of material from The Second City archives and is the perfect way to celebrate winter in the Methow Valley. And YES, this is “The” Second City from Chicago, the acclaimed Comedy Club that started off Tina Fey, Dan Aykroyd, Bill Murray, Joan Rivers, Steve Carrel and so many others. You won’t want to miss this! Oh, and you must be 21 years of age to enjoy this ride. Hear that? Yes, it’s the sound of bells a-jingling already. Next thing you know, dreidels are spinning and pumpkin-spiced everything is everywhere. Now your family is in town, you’re numbed to frosty snowmen and black Friday bargains…and it’s not even December! 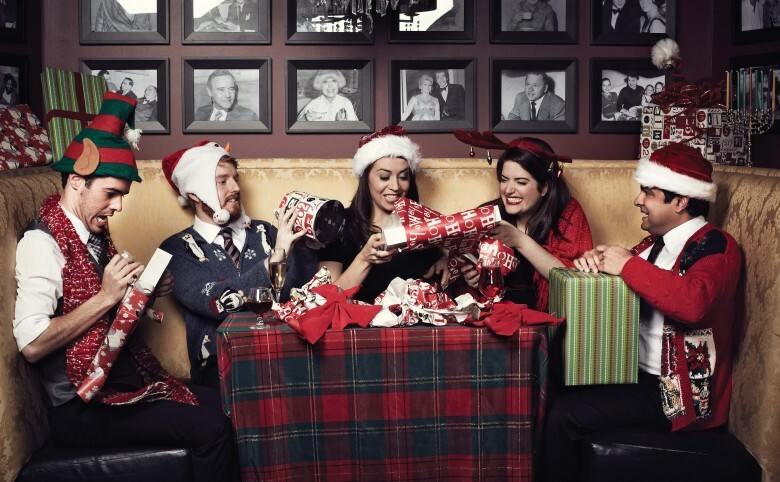 Thankfully, The Second City is here with the perfect upheaval of your holiday malaise: Holidazed & Confused bursts the monotony of the season with a riotous send-up of traditional holiday fare. Put away your turkey baster come down to laugh until your cheeks flush with ho-ho-holidazed joy. It’s naughty. It’s nice. And it’s definitely not like any other holiday show you’ll see this season! The Second City opened its doors on a snowy Chicago night in December of 1959. No one could have guessed that this small cabaret theatre would become the most influential and prolific comedy theatre in the world. The Second City developed an entirely unique way of creating and performing comedy. All attendees will be seated at a table for four–you’ll need a place to put your drink(s), after all. There are three table options, Gold Premier Tables ($250/4seats) in the front row, Gold Tables ($200/4 seats) in rows 2-3 and Standard Tables ($160/4seats). We encourage groups of 4 to attend so you know you’ll like your table-mates. If you have less than four and don’t mind gambling on who you’ll sit with, individual tickets at a standard table are $40.